Minutes from the new OWA amusement park and Beautiful Gulf Shores!!
" Chi Chi's French Country Home in the Oaks" is beautiful, spacious (2,600 sq. ft.) and serene. Arriving back in the oaks, after a fun filled day of activities, you will enjoy a relaxed evening in the spacious living room with the gas fire place or go outside for a glass of wine, have a wood burning fire, and star gaze among the massive oaks. 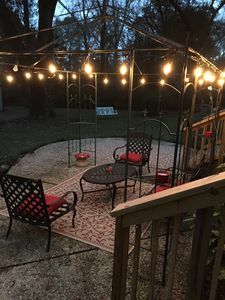 Being located in Robertsdale Al, commonly called "The Hub City "of Baldwin County, makes this property ideal for convenience and accessibility to multitudes of fantastic restaurants, great golf courses, beaches, shopping, parks , and FUN!! OWA Amusement Park is 14 miles south with the beach express only 2 minutes away. You will find the beautiful sugar white beaches of Gulf Shores only 30 min south, Historic Fairhope Al. 15 min west, Mobile ,(birthplace of Mardi Gras) 30 min west and fun filled Pensacola Fl. only 30 min east. Guest will enjoy having the spaciousness of this " Country French" home, with a huge master bedroom, queen size bed, private bath, and a Jacuzzi tub. The second bedroom is a comfortable full size bed and the third bedroom has adorable full size bunk beds. In the kitchen, you will find all the necessary equipment needed for a wonderful family breakfast, lunch or dinner if desired. "Chi Chi's in the Oaks" is a vacation you'll be sure to remember for a life time and will plan to return to often! !